Wanting to know more about sustainable management practices of cardamom produc-tion, a team of six from the International Centre for Integrated Mountain Development’s (ICIMOD) Himalica programme, and two Taplejung groups, Environment Conservation and Development Forum and the Cardamom Producer Groups, visited Hee-Gaun, Sik-kim, Gumba-Danda, Kalimpong and Himalica pilot villages in Taplejung, Nepal in 20 September through 1 October. The group’s aim was to develop a package of practices to demonstrate in pilot villages across the region. Cardamom growers in Taplejung have been facing drastic yield reduction in recent years due to disease and poor soil condition. 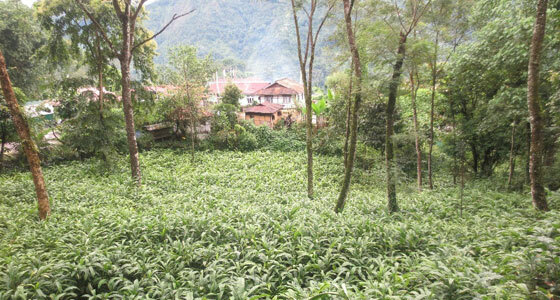 Practices on sustainable production of cardamom were demonstrated in small plots of land. One demonstration plot covered at least 25 households in the pilot villages. With up to 12 demonstration plots established in pilot site in Taplejung, around 300 cardamom-growing households are targeted for the Himalica iniative. Many climate smart practices were observed during the visit: shifting cardamom cultiva-tion to new areas; adopting a sound agro-forestry system; applying compost prepared locally from cow dung and leaf litter; using gap filling between plants through regular re-planting; preparing land through planting in rows for easy weeding and mulching; planting disease resistant and high yielding varieties of cardamom; cultivating different vegetables and legumes crops in the first and second year of the cardamom cultivation; diversifying income for risk management by integrating beekeeping, mushroom cultivation and pig raising; and encouraging auction culture for selling their cardamom on a competitive basis. A select a number of climate smart practices technologies related to sustainable carda-mom production will be selected and demonstrated in pilot villages, which will increase income of target communities, and maintain an ecologically sound production system. What's with the weather nowadays?